Do you travel with babies or toddlers? Then you know as well as I do the wear and tear it can put on your car seats. The baby car seat or booster seat can really wear your car seat and damage it, not to mention spills from a cup or drips from a bottle. Oh, and not to mention the little snacks that end up in the cracks of your seat. Yuck! That's why I want to tell all of you about Neat Parents REVERSIBLE Car Seat Protector. This seat protector is so easy to install, and the straps are easily adjustable. 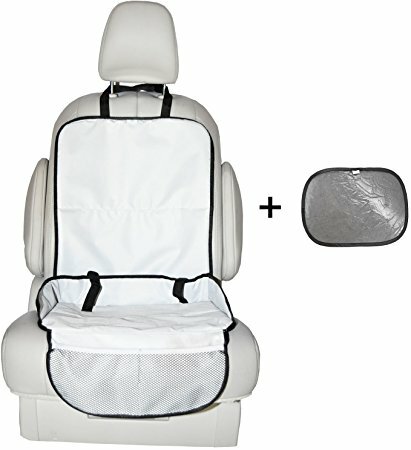 Plus the baby car seat protector is designed to attach to baby's car seat latches for extra stability and to prevent shifting.Plus there are 2 mesh pockets in the front to help keep things organized and easy to reach. I really like that they are light gray and black, so they are neutral enough to look nice in just about any car interior, and completely reversible too. They are really stylishly designed. Not only do these seat protectors protect against rubbing and fading, they also protect against food , liquids and dirt reaching your seat cracks. There's even a built in crumb catcher built into the edge of the seat protector that catches all the dropped food while your little one eats. We all know what a mess little ones can make in your vehicle. These are so nice for everyday use. This seat protector can even be used on dining chairs to protect then from sticky, dirty messes as well. As an added bonus gift I also received a cling window shade. It's lightweight and framed making re-positioning so easy. The sun shade helps to keep your little one comfortable while traveling.